High attrition rates among new teachers are of concern to teacher educators. Support mechanisms may help teachers feel less isolated in their new profession. Computer-mediated communication (CMC) technologies can connect novice teachers in ways that are both time and place independent. Most research on asynchronous online discussions has focused on achieving formal learning goals through highly structured scaffolds for reflective thinking and cognitive presence. Less attention is being paid to how novice teachers who are already accustomed to participating in online communities turn to these online spaces for the support they need. This case study examined whether and how eight preservice teachers completing English education internships at professional development schools chose to use an asynchronous discussion forum in the absence of a tightly structured or controlled communication task. The interns chose to use the online space for just-in-time informal learning and for psychological support on complex issues that were not easy to discuss face to face. The interns regularly responded to each others' requests, thoughts, and concerns. The authors propose that highly structured online forums are not the only way CMC can be used for teacher support, particularly now that CMC is no longer a novelty, nor should formal learning be the only purpose for providing such online spaces to novice teachers. Scherff, L. & Paulus, T. (2006). Encouraging ownership of online spaces: Support for pre-service English teachers through computer-mediated communication:. 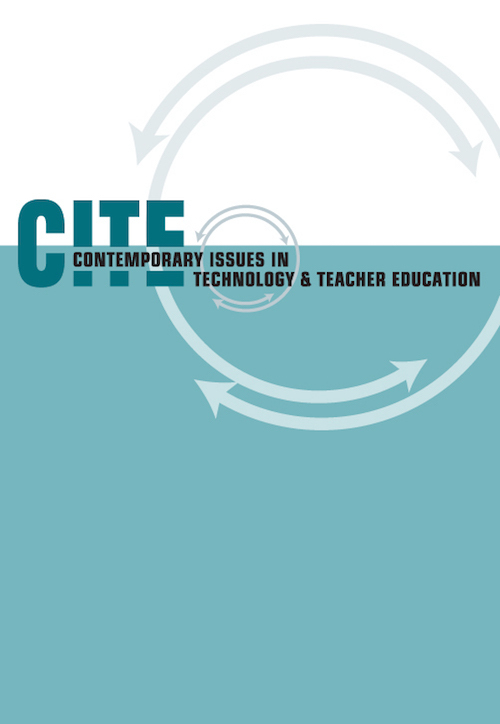 Contemporary Issues in Technology and Teacher Education, 6 (4), 354-373. Waynesville, NC USA: Society for Information Technology & Teacher Education. Retrieved April 25, 2019 from https://www.learntechlib.org/primary/p/22899/. Abdal-Haqq, I. (1998). Professional development schools: Weighing the evidence. Thousand Oaks, CA: Corwin Press. Andrews, S.P., & Martin, E. (2003). No teacher left behind: Mentoring and supporting novice teachers. Paper presented at the annual meeting of the Georgia Association of Colleges for Teacher Education/Georgia Association of Teacher Educators, St. Simons Island, GA.
Bodzin, A.M., & Park, J.C. (2000). Dialogue patterns of preservice science teachers using asynchronous computer-mediated communications on the WorldWide Web. Journal of Computers in Mathematics and Science Teaching, 19(2), 161-194. Chubbuck, S.M., Clift, R.T., Allard, J., & Quinlan, J. (2001). Playing it safe as a novice teacher: Implications for programs for new teachers. Journal of Teacher Education, 52(5), 365-376. Darling-Hammond, L. (2003). Keeping good teachers: Why it matters, what leaders can do. Educational Leadership, 60(8), 6-13. Doyle, W. (1986). Classroom organization and management. In M. Wittrock (Ed. ), Handbook of research on teaching (3rd ed. ; pp. 392-431). New York: Macmillan. Feiman-Nemser, S. (1983). Learning to teach. In L. Shedman & G. Sykes (Eds. ), Handbook of teaching and policy (pp. 150-170). New York: Longman. Glaser, B. (1978). Theoretical sensitivity: Advances in the methodology of grounded theory. Mill Valley, CA: Sociology Press. Goetz, J.P., & LeCompte, M.D. (1984). Ethnography and qualitative design in educational research. New York: Academic Press. Gold, Y. (1996). Beginning teacher support: Attrition, mentoring, and induction. In J. Sikula, T.J. Butterly, & E. Guyton (Eds. ), Handbook of research on teacher education (2nd ed; pp. 548-594). New York: Macmillan. Gold, Y., & Roth, R.A. (1993). Teachers managing stress and preventing burnout: The professional health solution. Washington, DC: Falmer Press. Hansen, J., & Sullivan, B.A. (2003). Assessment of workplace stress: Occupational stress, its consequences, and common causes of teacher stress. ERIC Document Reproduction Service No. ED 480 078. Hebert, E., & Worthy, T. (2001). Does the first year of teaching have to be a bad one? A case study in success. Teaching and Teacher Education, 17, 897-911. Hough, G., Smithey, M., & Evertson, C. (2004). Using computer-mediated communication to create virtual communities of practice for intern teachers. Journal of Technology and Teacher Education, 12(3), 361-386. LeCompte, M.D., & Goetz, J.P. (1982). Problems of reliability and validity in ethnographic research. Review of Educational Research, 52(1), 31-60. Lincoln, Y., & Guba, E.G. (1985). Naturalistic inquiry. Beverly Hills, CA: Sage Publications. Mantle-Bromley, C. (2001, April). The status of early theories of professional development school potential: Progress of four settings across the United States. Paper presented at the annual meeting of the American Educational Research Association, Seattle, WA. Merseth, K.K. (1990). Beginning teachers and computer networks: A new form of induction support (Report No. 90-9). East Lansing, MI: The National Center for Research on Teacher Education. ERIC Document Reproduction Service No. ED 324 309. Merseth, K.K. (1991). Supporting beginning teachers with computer networks. Journal of Teacher Education, 42(2), 140-147. Nagel, L., & Brown, S. (2003). The ABCs of managing teacher stress. The ClearingHouse, 76(5), 255-258. Nicholson, S.A., & Bond, N. (2003). Collaborative reflection and professional community building: An analysis of preservice teachers’ use of an electronic discussion board. Journal of Technology and Teacher Education, 11(2), 259-279. Osguthorpe, R.T., & Graham, C.R. (2003). Blended learning environments: Definitions and directions. The Quarterly Review of Distance Education, 4(3), 227-233. Ridley, D.S., Hurwitz, S., Hackett, M.R.D., & Miller, K.K. (2005). Comparing PDS and campus-based preservice teacher preparation: Is PDS preparation really better? Journal of Teacher Education, 56(1), 46-56. Rogers, D.L., & Babinski, L. (1999). Breaking through isolation with new teacher groups. Educational Leadership, 56(8), 38-40. Romiszowski, A.J., & Ravitz, J. (1997). Computer-mediated communication. In Cr. R. Dilles & A. Romiszowksi (Eds. ), Instructional developmental paradigms (pp. 745-768). Stephens, A.C., & Hartmann, C.E. (2004). A successful professional development project’s failure to promote online discussion about teaching mathematics with technology. Journal of Technology and Teacher Education, 12(1), 57-73. Tang, S.Y.F. (2003). Challenge and support: The dynamics of student teachers’ professional learning in the field experience. Teaching and Teacher Education, 19, 483498. Thomas, N., Clarke, V., & Lavery, J. (2003). Self-reported work and family stress of female primary teachers. Australian Journal of Education, 47(1), 73-87. Valli, L. (1992). Beginning teacher problems: Areas for teacher education improvement. Action in Teacher Education, 14, 18-25. Ziegler, M., Paulus, T.M., & Woodside, M. (2006). Creating a climate of engagement in a blended learning environment. Journal of Interactive Learning Research, 17(3), 295318. Zimpher, N.L., & Rieger, S.R. (1988). Mentoring teachers: What are the issues? Theory Into Practice, 27(3), 175-181.